The supply of contact lenses without an eye examination and prescription is illegal. 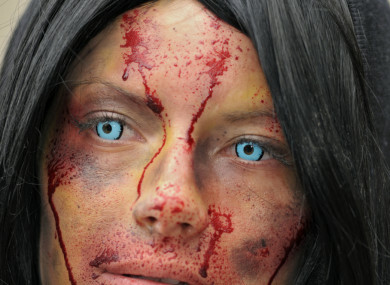 PEOPLE HAVE BEEN warned about the dangers of wearing cosmetic contact lenses this Halloween. The supply of contact lenses without an eye examination and prescription is illegal, and optometrists have identified growing complications associated with wearing such lenses. Lynda McGivney Nolan, Optometric Advisor with the Association of Optometrists Ireland (AOI), said these complications can result in devastating consequences with the potential to cause permanent vision loss. “Studies investigating the reasons for the increased risk of complications with these lenses have shown two important things. Firstly, cosmetic contact lenses are more difficult to clean and sterilise because of the materials they are made of and the pigments which colour them. This makes microbial adherence much stronger. The AOI is calling on schools and parents to warn children and young adults about the dangers of wearing such lenses and to refrain from buying them online or in costume shops. McGivney Nolan said websites or shops selling the lenses should be reported to the State health and social care regulator, CORU. In Ireland, as in most countries, contact lenses are regulated and may only be fitted and supplied by a qualified, regulated professional such as an optometrist. A 2017 US study, published in the Journal of Forensic Science, showed that the quality of contact lenses sold without prescription was very poor – microbes were living on 60% of counterfeit lenses and 48% of non-corrective (decorative) lenses when they came out of the packet. Analysis of the contaminants linked them to eye infections and conjunctivitis, which could lead to permanent visual impairment or even blindness. Email “People warned that cosmetic contact lenses could lead to vision loss ”. Feedback on “People warned that cosmetic contact lenses could lead to vision loss ”.